Crazy Shooters is an interesting shooting game developed by FreezeNova. 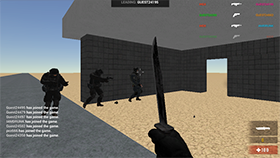 In Crazy Shooters, you are a soldier and you will play with "first person perspective". Your mission in Crazy Shooters is to destroy as many enemies as you can and win all the matches. With interesting gameplay and unique 3D graphics, I believe you will enjoy playing Crazy Shooters. You have 100 HP. If you are hit by an enemy, your HP will drop and when your HP drops to zero, you will die. Try to move skillfully and kill as many opponents as possible. Each time you kill an enemy, your team will have a kill. The duration of each match is 10 minutes. When the time is up, the team with the most kills will win. Interesting in Crazy Shooters is that you can use up to 9 different weapons to fight, including BallisticKnife, Deagle, MP5KA4, STW-25, M87T, Blaser R93, RPG, M79 and M67. Good luck and have fun! Use 1-9 key to change weapon. Your gun has limited ammo. When your gun runs out, you cannot use it. You need to spend time loading bullets. In Options, you can customize Sound, Music, and Sensitivity. If you want to find Crazy Shooters Unblocked, you can click at freegames66.com. Here are hundreds of different unblocked games that you can play all for free, with just one click. Besides, you don’t need to install anything when playing unblocked games on freegames66.com. Now, enter Crazy Shooters Unblocked, join the fierce fight with other players. Play now!